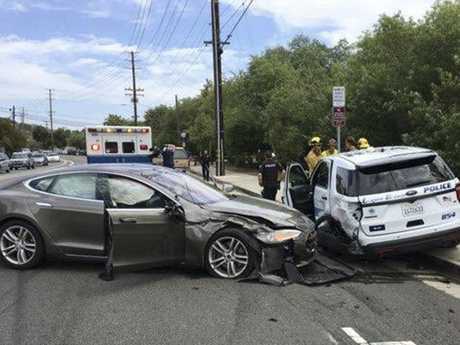 A Tesla car that was in Autopilot mode crashed into a parked police SUV in southern California today. Picture: Laguna Beach Police Dept. 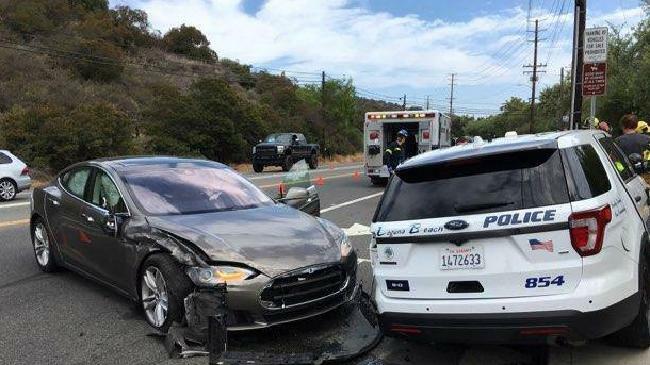 POLICE in Southern California were first on scene at an electric car crash because the vehicle - on Autopilot at the time - rammed into a police cruiser. Laguna Beach Police Sergeant Jim Cota told reporters the collision, which took place shortly after 11am on Tuesday, local time, resulted in minor injuries for the driver. The police SUV ended up with its two passenger-side wheels on the footpath but no officers were injured. It works with the assistance of radar, 360-degree cameras and sensors to detect nearby vehicles. The Tesla on Autopilot is capable of changing lanes, parking and braking to avoid collisions, the company claims. 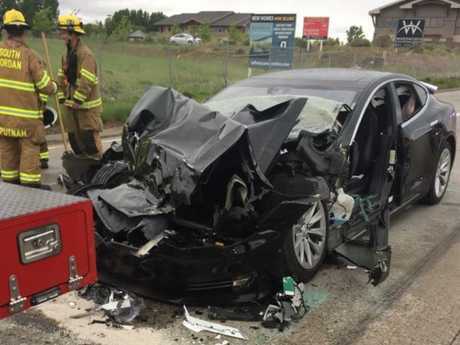 Earlier this month, a Tesla on Autopilot slammed into a fire truck in Utah. The 28-year-old driver told police she was looking at her phone when the crash happened, according to CBS News. Tesla co-founder Elon Musk took to Twitter after the first crash to protest about the negative press coverage it was gathering. Responding to a story in the Washington Post, Musk wrote: "It's super messed up that a Tesla crash resulting in a broken ankle is front page news and the 40,000 people who died in US auto accidents alone in the past year get almost no coverage." "What's actually amazing about this accident is that a Model S hit a fire truck at 60 miles per hour and the driver only broke an ankle," Musk tweeted. "An impact at that speed usually results in severe injury or death." Mr Cota expressed surprise on Tuesday when talking to reporters. "Why do these vehicles keep doing that?" he said, according to the Los Angeles Times. "We're just lucky that people aren't getting injured." In a statement, Tesla said it could not immediately confirm the driver's report about whether the vehicle was being operated manually at the time of the crash. "Tesla has always been clear that Autopilot doesn't make the car impervious to all accidents."